In the mid-1960s, real estate developer Stephen A. Calder envisioned summertime racing in Florida; in 1965, on the advice of Mr. Calder, the Florida Legislature approved a bill allowing for it. Prior to this time, a fall meet was held at Tropical Park in Miami and a spring meet at Gulfstream Park in Broward County. In 1970, Stephen Calder received a permit for summertime racing but the meet was run at Tropical Park Race Track because construction was not complete at Calder. On May 6, 1971 Calder Race Course held its first day of racing and in 1972 racing ceased at Tropical Park. The 1980s brought about renovations and expansions and two purchases. The first purchase was by Bertram R. Firestone and the second was by Kawasaki Leasings, Inc. In 1992 the "Festival of the Sun" was introduced. By 1997, simulcasting was introduced (so bets could be placed on Calder races from other tracks and off-track locations). The handle increased significantly; the track increased purses. 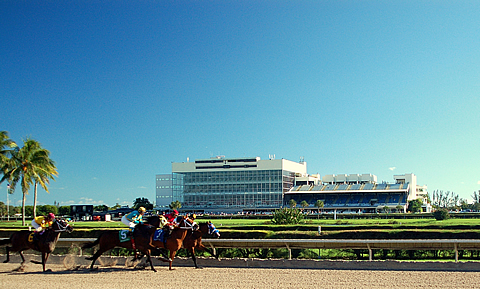 In January 1999, Churchill Downs Incorporated purchased Calder Race Course for approximately $86 million. In the first years of the new century the track introduced the "Florida Million" and the "Summit of Speed". Calder's Summit of Speed has produced several Breeders' Cup champions and Eclipse Award winners since its start in 2000. (The Eclipse award is the highest honor bestowed in American racing). In its short history, the Summit of Speed has attracted some of the country's top sprinters, including Cajun Beat and Orientate who both went on to win Breeders' Cup Sprint championship races (Orientate 2002, Cajun Beat 2003). Plus, in 2005, Lost in the Fog won at Calder, although was later defeated in the Breeders' Cup. The Summit of Speed has turned out to be the single biggest day in the history of Calder. In 2004, over $10.8 million was wagered on the event. The "Florida Million" is a $1.2 million dollar 8 race stakes program for Florida-breds taking place late in the year. These races consist of the $200,000 Carl G. Rose Classic Handicap, the $150,000 Bonnie Heath Turf Cup Handicap, the $200,000 Elmer Heubeck Distaff Handicap, the $150,000 Jack Dudley Sprint Handicap, the $100,000 Arthur Appleton Juvenile Turf, the $150,000 Joe O'Farrell Juvenile Fillies, the $150,000 Jack Price Juvenile, and the $100,000 John Franks Juvenile Fillies Turf. In 2003, the unincorporated area where Calder is located became the City of Miami Gardens, the third largest city in Miami-Dade county. In 2004, Calder opened a card room on the premises which was relocated to Gulfstream Park in 2006. Calder is hoping for an expansion into slot machines. Calder also plays host to the Florida Stallion Stakes program, which had record nominations this year. In addition, Calder is site for two prestigious horse sales annually, the Ocala Breeders' Sales and the Fasig-Tipton sales. The world record for the most spent on a Thoroughbred at sale took place at Calder in 2006 when a two-year-old horse sold for $16 million. The horse was later named The Green Monkey. In late November 2009 one horse at Calder was discovered to have the equine herpesvirus. Some barns were placed under quarantine and two stakes races were postponed. The track consists of a one-mile (1.6 km) dirt oval and a seven-furlong turf course. The track contains stalls for 1800 thoroughbreds on its property. In addition it has a seating capacity of 15,000 people. The size of the parcel is 220 acres (0.89 km2). Calder's jockey colony is reflective of the diversity of Miami. With the Calder oval serving as a launching pad for jockeys coming from Latin America and the Caribbean, many jockeys have gained valuable riding experience before success at other racetracks across the country. Top jockeys who started their careers at Calder include Javier and Abel Castellano (Venezuela), Eibar Coa (Venezuela), Rene Douglas (Panama), Shaun Bridgmohan (Jamaica), Edgar Prado (Peru), Pedro Rodriguez (Cuba), Alex Solis (Panama), José Ferrer (Puerto Rico), Jorge Chavez (Peru), Jose Santos (Chile), Cornelio Velasquez (Panama), Manoel Cruz (Brazil), Jacinto Vasquez (Panama-retired) and Eddie Castro (Panama) among others. In addition, Stewart Elliott of Smarty Jones fame and Gary Boulanger (retired) are a few Canadians who led the ranks at Calder early in their careers. Winners of the Eclipse Award for Outstanding Apprentice Jockey that hailed from Calder when they won – Rosemary Homeister (1992), Phil Teator (1997), Shaun Bridgemohan (1998) and Eddie Castro (2003). Jockeys whose careers started at Calder and went on to Eclipse Award for Outstanding Jockey : Jerry Bailey (2000-2003; 1995-1997), Jorge Chavez (1999), Mike E. Smith (1993), Jose Santos (1988).